The Foot and Ankle Clinic of the Virginias is a podiatry clinic in Virginia and West Virginia. 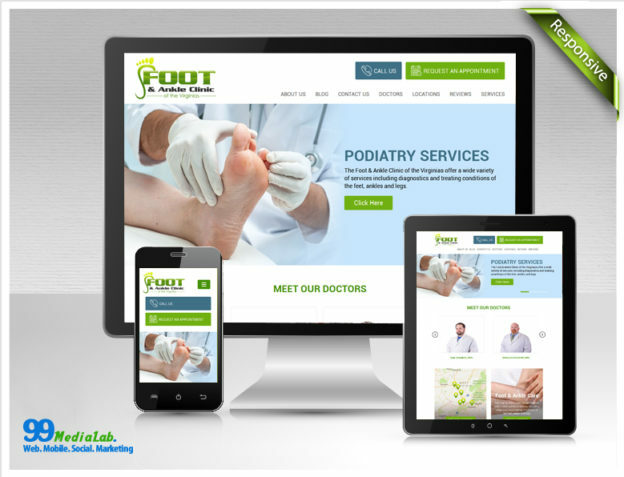 It is run by seven board-certified podiatrists who pride themselves in dealing with all ailments concerning feet and ankles. This team provides everything from diagnostic services to both surgical and non-surgical treatments for their client base. They have a wide market in their locales based on effective word of mouth marketing. They tried to establish an online presence with a website but, as you’ll see in a moment, they weren’t having any conversions. The second pain point for the website was the advertising. The clinic ran PPC campaigns on Google but wasn’t receiving consistent results. PPC advertising can be a powerful way to attract new customers and has been proven to work in numerous circumstances. Unfortunately, however, this only works when you know what you’re doing. The clinic was using Google AdWords Express, which bids on autopilot and isn’t optimized for any keywords. When you’re not targeting specific keywords, you find yourself advertising to a much broader base of potential customers, many of whom aren’t even interested in your products to begin with. As a result, the clinic wasn’t seeing a solid return on their money. We began by suggesting that the client migrate the website to WordPress and give it a facelift, optimizing it for the visitor so they could easily access their services. We also suggested a better planned advertising campaign. The short-term goal was to migrate the website to WordPress and make it SEO friendly. The client offered a service that was very specific and so would most likely appeal to a very specific niche audience. We, therefore, asked them to start a proper blog where they would write authority articles that helped their visitors with issues. With proper SEO these articles would find their way to the top of Google search engine results pages and attract leads to the website that would then see the services offered by the clinic. We also wanted to add as many calls to action (CTAs) as possible throughout the site pages in order to make it easier for visitors to schedule an appointment with any of the clinics belonging to the client. That way it would be easier to convert leads. The long-term goal was to improve the website’s PPC campaign. This would be a little more difficult, but it would definitely be worth it. We would first do an extensive amount of research on the appropriate keywords for the niche the website was in and then find the cheapest ones to bid for. In PPC the long tail keywords are the cheapest to bid and tend to have the least competition, giving you a bit of an edge in the long run if you choose the right ones. We would also take the client off AdWords Express and let them take control of their own PPC campaigns. We immediately set about working on the wireframe for the WordPress version of the website, looking to adopt the right theme and have as many spots for CTAs as we could. We showed the first draft to the client, and they were happy. They didn’t have many corrections to request, except maybe the color scheme, and were ready to give the project a go ahead. Throughout the process, we kept up communications with the client and even let them see the development of the website in real time via a special link. It was complete in 6 weeks and ready for launch. The PPC work took an additional 4 weeks and showed great results. The website received a huge surge in visitors, both from the SEO and the PPC campaign. The conversion rate was also much better due to the CTAs placed at strategic spots on the website. This boosted the clinic’s customer base, and the client was very happy with the work.